The Kerry is a striking dog, projecting nobility-and he knows it! Take him for a walk down Main Street and watch people turn admiringly in your direction. In fact, before you know it, complete strangers will “talk Kerry” to you. The Kerry is a clean dog; he never sheds a hair and has no doggy odor. Because he does not shed, his coat requires extra care to keep neat. He is an ideal size for any home or apartment-compact, sturdy, just right! However because of his energy level, he is best suited for homes with a private yard. One of the Kerry’s outstanding characteristics is his wonderful sense of humor-with a touch of blarney. Breeders from the “auld sod” used to say that the Kerry communes with the “little people.” After you and your Kerry have come to know each other, you will realize the empathy between the two of you-marvel at his uncanny intuition when in conscious clownishness he tries to brighten your darker hours. You and your Kerry will undoubtedly become a mutual admiration society. Again quoting the late George Proctor: “Once a Kerry convert, always a Kerry lover.” Now let us look at the few things you owe this Kerry who is ready to give you so much. Puppies may generally be given all they will eat at each meal. At 12 weeks of age, they should get 3 meals a day. By the time they reach 4-6 months, you will notice their appetites decrease. Feed them 2 meals a day at this time. Your Kerry, above one year, needs only 1 meal a day. Always keep water within easy reach. 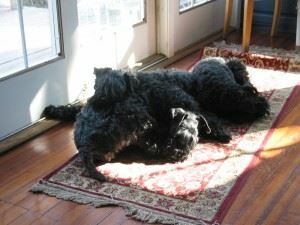 When Kerries reach the age of 12 months, they should be fed enough to keep them healthy and agile, but not enough to “fatten them up.” A simple gauge in telling if your dog is putting on too much weight is to observe his ribs If they can be felt with noticeable ridges between them, your Kerry is underfed. If you have difficulty feeling them through the “upholstery,” he is overfed. You should just be able to feel his ribs. What you feed your Kerry and particularly your growing puppy is of course as important as how much you give him. If you purchased your puppy from a reputable breeder, you no doubt were given the formula used in feeding the puppy. There are so many good dog foods on the market today, and competition is so keen, that companies are constantly improving their products. You will hardly go wrong with any of the better known brands. There are even foods for the youngsters that are fairly complete in your dog’s basic requirements. We feel, however, that your dog needs the bulk and ingredients in dry dog foods (meal) as well as added meats, eggs, milk, etc. It is a fallacy that raw beef and milk give puppies worms. They need foods rich in calcium and proteins. If you are a one dog family, there is nothing wrong with feeding leftovers to your dog. A diet of only tablescraps, however, is not sufficient for your Kerry’s growth and development If used, give them as a treat or mix them with a dog meal. Preventive vaccination is your surest means of avoiding illness. By the time you bring your puppy home, the breeder should have started it on vaccinations. At 9-10 weeks of age, the puppy should be given its first vaccination of the attenuated live-virus type. If the puppy is beyond that age, make sure that the breeder has vaccinated it. At 14 weeks, it should get its second, “permanent” vaccination, preferably repeated annually. These are your best guards against distemper, a disease that takes many forms, much as viruses in ourselves. Your veterinarian is your best guide as to which vaccines to use. Ask for and follow his advice. Do not wait for your puppy to get sick before checking with a “vet.” While you are at his office, ask to have your puppy checked for worms. In spite of precautions, it is quite common for puppies to have them. Don’t worm it yourself with patent medicines. You may give it too strong a dose, even worm it unnecessarily. It is most important that you realize your puppy is still a baby needing plenty of sleep. If there are children in your home, impress upon them to curtail playtime and to stop before it gets exhausted. During its teething period, a puppy has the natural tendency to gnaw on something, possibly your own hand. Do not encourage this mouthplay; it could lead to an undesirable nipping habit. The Kerry is drop-dead gorgeous when properly groomed. To keep this image, requires almost daily brushing, frequent bathing, and monthly trimming. Few dog groomers know how to properly scissors a Kerry. Often your Kerry may come back from the groomer looking like a Poodle or a Schnauzer. You can however learn to do it yourself. Be prepared to spend a few hundred dollars on the right equipment. The learning curve that may stretch over several years. If you know of a Kerry groomer, or if you live close to your breeder, you are a step ahead.